Of all the American Masters series on PBS, the film I keep thinking about is Alice Miller, creator of the top notch Chez Panisse restaurant in Berkley CA. There’s a time near the end of the film where the question is being answered “where to now?”, (thirty years on), when Alice enters a neighbors vegetable garden. She picks various vegetables and herbs and procceds to think aloud about what she might prepare, exactly the approach of her restaurant, whose chefs receive fresh food from the restaurant’s 75 supporting farms and then decide what the menu will be. I find this a wonderful analogy to the work of creating porcelain pottery because of the invitation to constant challenge and change. For a potter, what we see is never what we get, which just might mean that a constant enticement exists for open risk, not unlike picking or receiving fresh fruits and vegetables and then deciding what the menu will be. I have this porcelain clay, an idea about form, these slips and stains to create color, an idea for decoration, a few glazes to use, and a particular type of kiln and atmosphere to fire the pots; what am I going to cook up today, this week, this year? For me the circle is completed through a spirit of experimentation, just like the chefs at Chez Panisse. Naturally the talents and experience of the particular chef or the potter will make itself apparent, to be guided, influenced, and carried forward by the everyday engagement of the process of cooking, either in the kitchen or in the potter’s studio. Carried forward to one possible consequence, a spirit of openness just might prevail, in my case or in the case of a chef, concerning the sharing of recipes. It’s always tempting to close down, to say, “I’ve worked for YEARS, and this recipe is MINE,” but in the end it’s the artist or the chef who suffers from keeping their favorites close to the chest, whether that be a glaze recipe for cone 10 reduction or a chef’s best glaze recipe for cake. The spirit of generousity is the portal to creating new space for new invention, creativity, and expressive content, a best side of the “devil may care” attitude that Dad used to talk about. 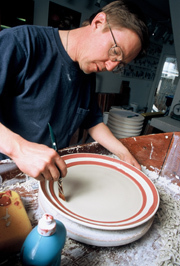 After thirty years as a potter, I now realize that it has been such an attitude that has lead to a lifetime of ever-widening circles of the Call to expression.